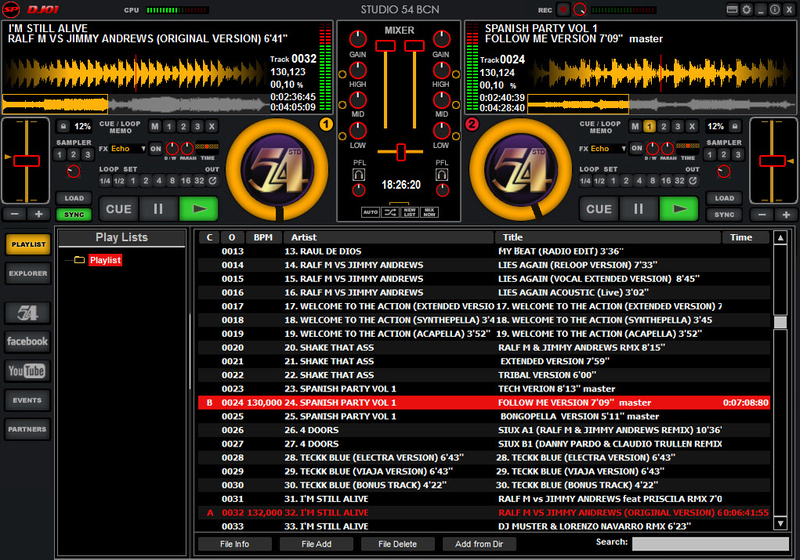 Studio 54 BCN Ed is a professional DJ Software for Windows, it´s a full functionally DJ tool completely free. Intuitive and ergonomically designed for deejays, DJ ProDecks lets mix your music without limits. Just drag and drop your music into the application’s interface from folders or explorer, that is the way to start your mix!!!. You only need load your music tracks into DJ ProDecks, it will scan automatically the files to assign their beats per minute (BPM). Studio 54 BCN Ed offer an advanced Tracklist with two levels (with Explorer and/or Playlist depending of the size of the screen), also it has three different forms to select your system performance to offer the best way to adapt DJ ProDecks to your computer with optimum efficiency. For Fast, Medium and Slow computers also included Netbooks settings. The easiest way to become a DJ with professional and advanced functions, now compatible with Windows 10. * New Automix with shuffle and multi-list. * Three effects per load (Echo, Flanger, Wha). * Three samples per load. * Three memory banks per load for CUE points or Loops. * Scratch with an integrated wheel. * Use of keyboard how software controller. * Supports a large number of audio formats: Mp3, Mp2, Mp1, Ogg, Wav., Aiff, Wma, ACC and Fla.
* Add a cue or loop pointer marker at any point in a track to instantly start playing the track from that point. * Auto loop from ¼ to 32 Beats. * Real time Equalization on each Deck (track) with Mute. * Advanced Tracklist until two levels (Explorer and Playlist) resizable to the end of the screen. * Complete Audio Setup (include ASIO support). * Simple and intuitive user interface designed for DJs. * Links with complete information about our parties.